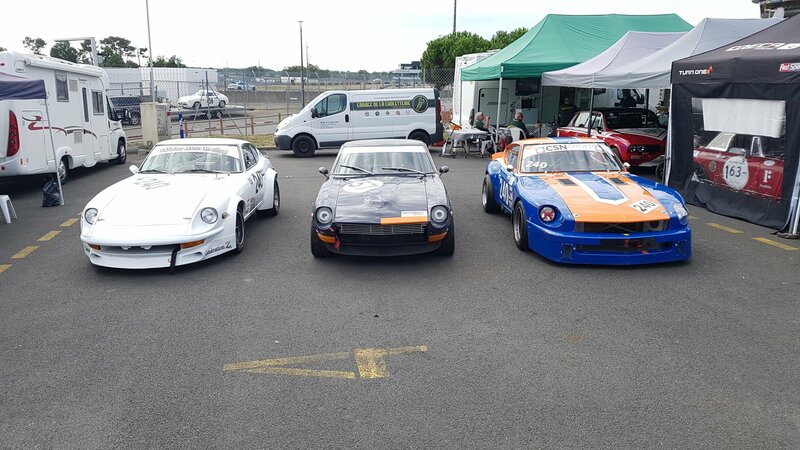 I started to get wind of this event a couple of months before and quickly became very excited as it became apparent that no less than 4x 240Zs would be racing, albeit in two different series. 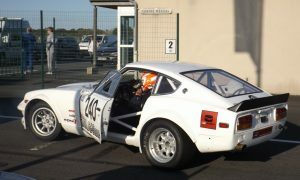 There was almost a fifth but Dean Halsey was busy sorting a spare engine and preparing for Donnington – his first race alone with no co-driver. 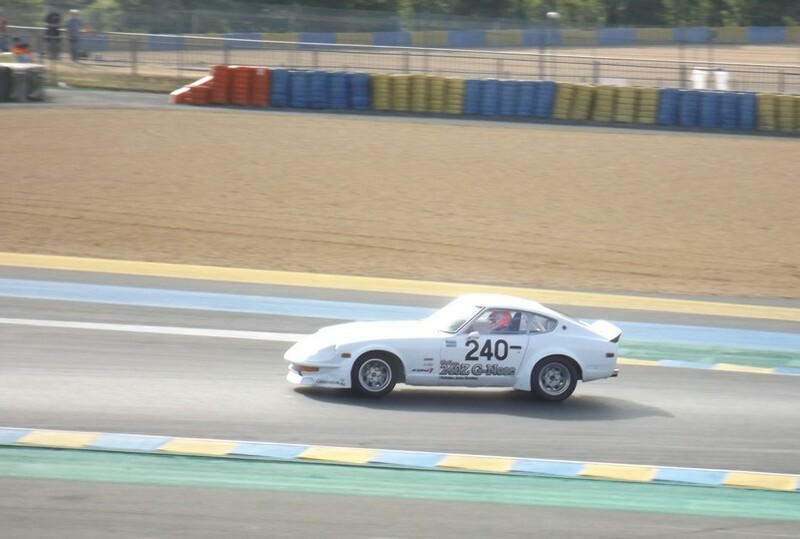 He and Bruce Weir did pretty well with 1st and 2nd in class from 4th and 8th overall! 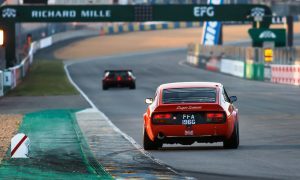 Back to the Le Mans Bugatti circuit and it was Charlie Valinho in his white 240Z ‘G’ sharing the ASAVE GT Touring 66-81 championship (1x 1hr race) with Jean-Marc Schneider in his Valinho-prepared dark blue 240Z. 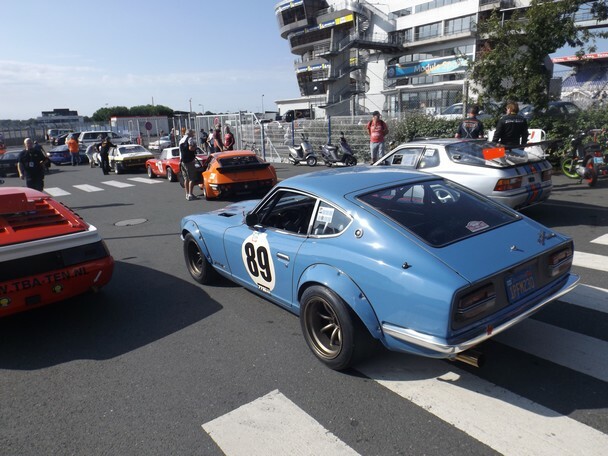 In the CSN Groep YTCC series (3x 1/2hr races), with a lot of cars from Denmark were Michael Stegmann in his light blue ‘road’ Z and ‘our’ Geoff Hanson in his LY-bodied 240Z. Both of these drivers worked hard on their cars all weekend – suspension and oil temperature for Michael, differential for Geoff. 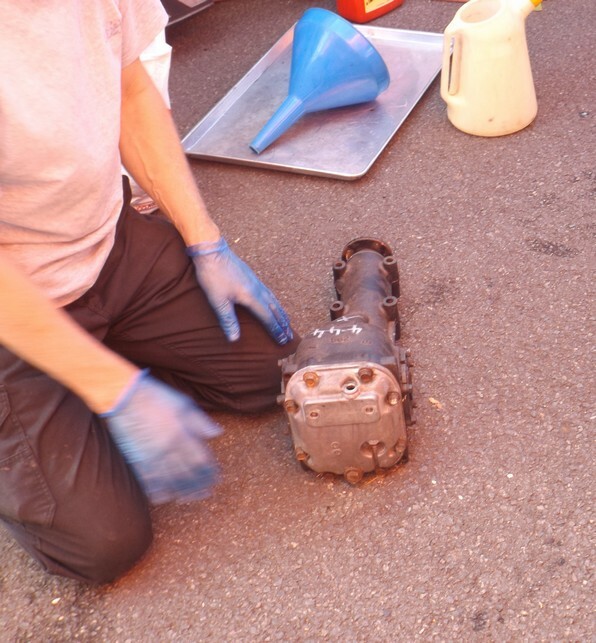 I arrived with a spare diff for Geoff, seals, gaskets and all as his was ‘poorly’ – not easy to find an R180 4.44 diff just like that but he’d contacted me earlier that morning and I scoured my stock ! He kindly left a paddock pass for me and my car – Toyota Corolla T-sport but more of that later ;-). He had a falling oil-pressure problem due to the heat and the oil becoming more fluid, it was hot that weekend (+30°c in the shade) so I introduced him to Geoff who spoke with a couple of mates next door with a split window ‘vette StingRay and they handed him some better racing oil – fantastic friendly atmosphere in the paddocks. 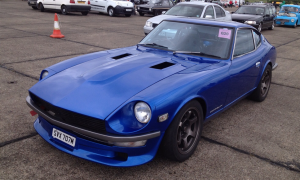 I watched the YTCC races on Saturday afternoon with David and Harold of the French Datsun club. David then went off to race in karting team on the Alain Prost circuit whilst I went off with both French teams to get a bite to eat, meeting up with David after his race (they came 14th out of 30 I think). We headed back to his place just 30minutes away and crashed out. The next morning (Sunday) I was up early and at the circuit by 9am to watch the 1hr ASAVE race with just time to say hello and check upon each team and driver. A very exciting race, frenetic, punishing pace under very trying and hot conditions for the drivers and almost ended with both Charlie and Jean-Marc on the podium but unfortunately, a retaining bolt on the white Zs’ alternator fell out causing it and the fan-belt to fall out of place, which ended in a seized water pump and a BIG cloud of white behind the car and the jury is still out whether or not the engine is done for! 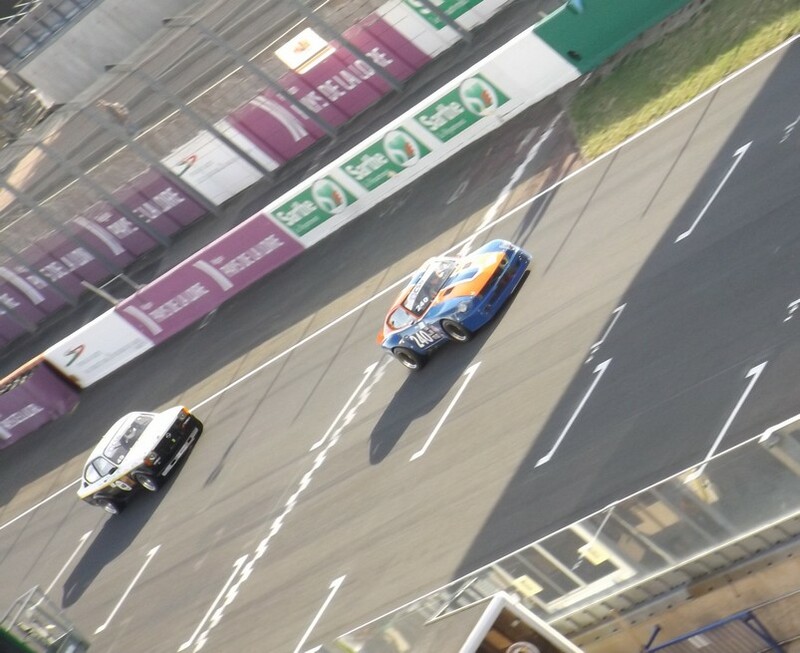 But where one fails, another triumphs and Jean-Marc gained a well-earned 3rd on the podium for what is only his third race. 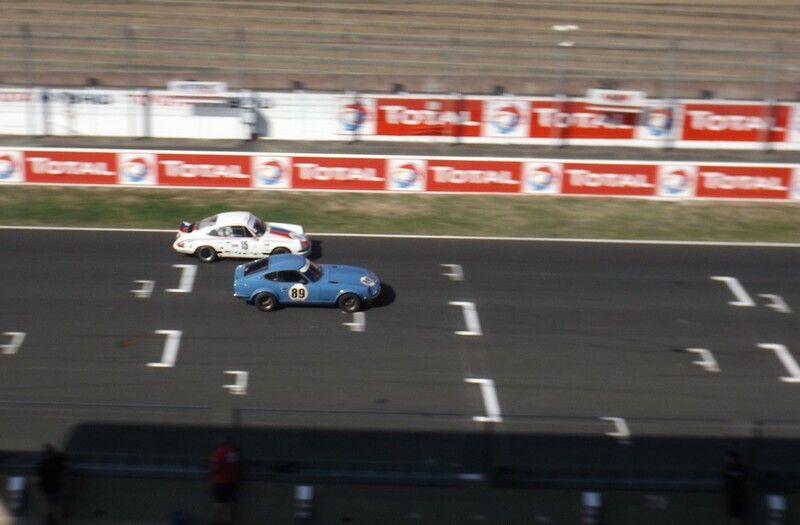 He had a monumental battle with a white Porsche 911 eventually leaving it several lengths behind – we all cheered J ! 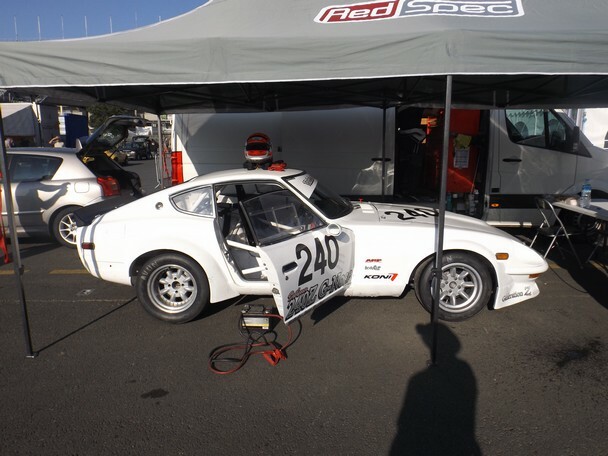 We had organised a 4x car photoshoot but in the next race (YTCC) with Michael extremly (too) keen to make up some time now running on full-slicks and not semis, span out on cold tyres. 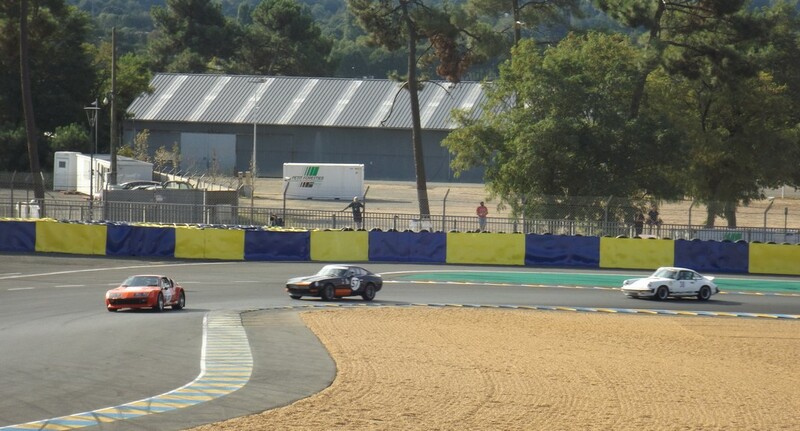 This didn’t harm him because I’m quite sure he saw red-mist and chased down most of the field until that half-shaft gave out but he ought to be pleased as the car showed what it can do when really pushed and he’ll tweak it some more – I know him now ;-). So he was towed directly back to his paddock spot – shame ! Just after the photoshoot, I’d booked in for some parade laps…yes certain guys, remember what that means – behind the safety car ! 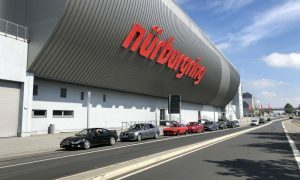 In fact I paid €20 for a two-day entrance pass and 20 minutes of the Bugatti circuit. 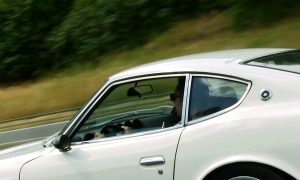 David wanted to begin a series of personal videos of atypical cars so he joined me and off we went…..last of course with other drivers thanking us for being so courteous. Needless to say we hung back to open some space and let rip ! 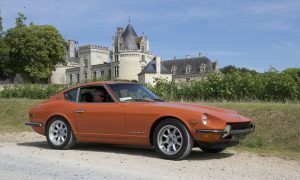 J The Toyo is a modest-looking, rather banal non-descript grey thing but with their VVTLi 192bhp engine and uprated chassis – a modern-day ‘Q’ car or ‘sleeper’ and when you keep the revs above 5k, it is a lot of fun on the circuit…. ! 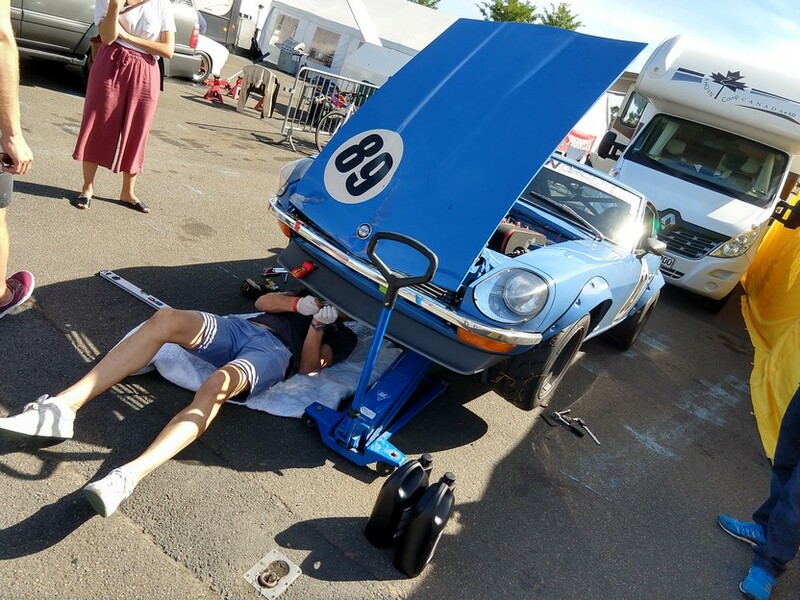 I’ve changed the srpings for lower, stiffer ones, uprated the front brakes and fitted strut braces front and rear which whilst wearing new Toyo tyres gave it an edge against the other players making the most of the track time ; Porsche 911s, Jag XKR, Alpine, Corvette etc…. ! Anyway, here is the video – a bit long so I won’t object to you zapping a bit here and there….the next one in my Z I hope ! 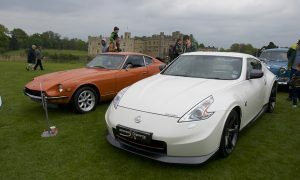 I spent a little time chatting with some of the other drivers – the guy with an IMSA Triumph TR8 was interesting as was a Mazda RX-3 with his 1300cc engine producing 300bhp running on 4x coils – one could be overwhelmed by the passion pouring out over these cars – I’ve never seen a Jensen Healey race either – wonderful variety. After saying goodbye through the pits, I drove back across country as per the trip up enjoying the empty, country roads but not too much as the national speed limit has been dropped from 56mph to 50 and it’s isn’t easy to adapt….especially with my Toyo who, I’d like to share with you still returned an average of 38mpg over the whole weekend on unleaded 95. 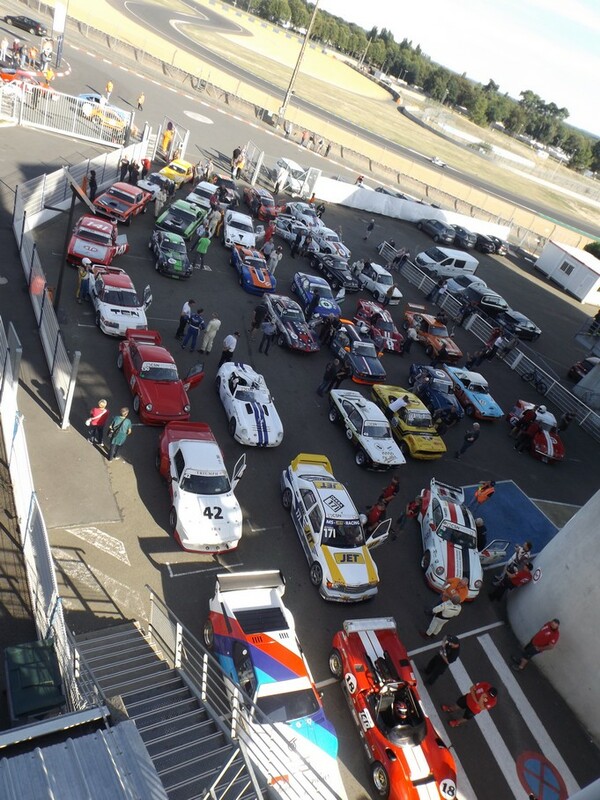 Race events like this help maintain my passion for Zs and remind me of my first days back in ’89 in the HSCC pits with the likes of Dave jarman et co. Thanks for all who particpated and my thoughts are with Geoff having a hard time atm – chin up mate !